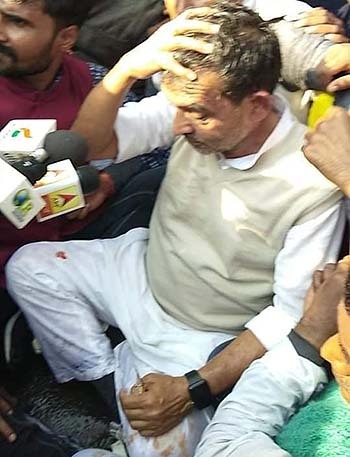 Patna, Feb 2: Former Union Minister Upendra Kushwaha and half-a-dozen RLSP activists were injured in a police lathicharge on Saturday during a protest in the Bihar capital. After Kushwaha sustained injuries in his head, leg and and hand, party sources said, adding he was admitted to a local private hospital and discharged after initial treatment. "The police first used water cannon to disperse the protesting Rashriya Lok Samata Party (RLSP) leaders and workers followed by a lathicharge," said party spokesperson Madhav Anand. He alleged the police deliberately attacked Kushwaha, blaming Chief Minister Nitish Kumar for the police action. The RLSP's protest highlighted the alleged collapse of school and higher education system in the state.